She dresses in red because she’s the ‘Red Queen’. Historical Fiction at it’s most subtle. Continuing the series on the history of The White Queen, this week is the turn of Margaret Beaufort. The excellent Amanda Hale’s portrayal shows her as utterly dedicated to her son, though it would seem to border on the obsessive, the same of which can be said of her faith and piety. This image of Margaret is quite plausible, though the vision of her piety is quite modern. In brief; Margaret was born in 1443, the only child of John Beaufort, Duke of Somerset. Her father was a great grandson of Edward III and died a year after her birth. In 1452 King Henry VI gave wardship of Margaret to his half brothers Edmund and Jasper Tudor, and she married Edmund three years later, upon reaching the marriageable age of twelve. Within a year of marriage to Edmund, he had died of the plague and Margaret would give birth to his son Henry two months later. She remarried in 1462 to Henry Stafford, though despite a ten year marriage, she would not fall pregnant again. Stafford died in 1471, the same year as the battle of Tewkesbury which saw the Lancastrian forces utterly crushed, leaving Margaret’s son the sole claimant for Lancaster. Jasper Tudor took the boy, Henry, into exile in Brittany for his own protection and Margaret remarried Lord Thomas Stanley. Despite two long and successful marriages with her two latter husbands, Margaret honoured her first husband, by asking to be buried beside him. After Edward IV’s death and the disappearances of his sons, Margaret worked to put her son on the throne. She arranged for money and information to reach his army in Brittany and garnered support amongst the English nobility, though she would be put under house arrest when Richard III was made aware of her plans, her lands forfeited to her husband. These were restored to her under her son’s rule, when he deposed Richard and became Henry VII. Henceforth she was addressed ‘My Lady the King’s Mother’. She, quite literally, wrote the rulebook on how the royal household was to be run and devoted herself to educational patronage and her religion. She was close to the royal family, but outlived her son by two months. After Henry VII died, she arranged his funeral and the coronation of Henry VIII, passing the day after his eighteenth birthday in 1509. She is buried in Westminster Abbey. Henry would be Margaret’s only child, probably because of her youth when she delivered him. She was just twelve when she fell pregnant and thirteen when she gave birth. The birth was a difficult one and it was thought, at one point, that neither mother nor child would survive. As a newborn, Henry was weak and his survival was attributed to his mother’s care. Margaret remained with her son for the first two years of his life at Pembroke Castle, where she would have had charge over Henry’s upbringing. In 1461 Pembroke Castle passed to the Herberts of Raglan. Margaret left to marry Sir Henry Stafford, leaving her son in the care of William Herbert who had been granted his wardship. Despite the separation, Margaret received regular reports on his education and development, and it is probable that the Herberts intended to marry him to their daughter. When Henry went into exile, Margaret maintained contact with him and supplied him with money and information about the English Court. This would become especially useful after Richard III’s usurpation of the throne, which in turn brought Henry closer to the throne. By this time, Margaret was married to Thomas Stanley. Stanley was high in favour at court and it was probably through her husband’s position that Margaret first heard the rumours that the princes in the tower were dead. By the time the rumours were commonly known, Margaret had secured Henry considerable support among the nobles and, with Elizabeth Woodville, had arranged him a marriage with Edward IV’s eldest daughter. Without the support that Margaret had secured for Henry, it is doubtful he would have succeeded at Bosworth. While Margaret’s support of Henry was constant throughout his life, she would not have openly supported her son’s claim to the throne while Edward IV was on the throne. The Yorkist claim was strong, Edward had two sons to follow him, a brother and that brother had a son. It was only through a series of drastic circumstances that led to the removal of all but one of these claimants that gave Henry the opportunity he needed to take the throne. When Margaret’s activities became known, Richard had her lands forfeited to her husband, Margaret was put under house arrest and her allies, including her cousin and prominent courtier, the Duke of Buckingham were arrested, attainted and in Buckingham’s case; executed. Had she made her intentions known publicly and spoken out against the king, in favour of her son, earlier there is no doubt she would have suffered some repercussions. A depiction of Margaret kneeling in prayer before an open book of hours. Margaret was known to spend several hours daily in prayer, while the furnishing of the rooms reveal her wealth. 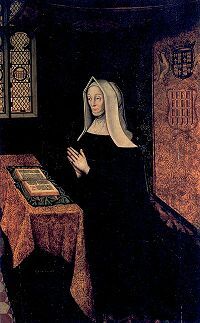 Even in an age when religious works were common among women, Margaret Beaufort was especially noted for her piety. As an infant, she was ‘married’ to John de la Pole, a contract which was dissolved when she was eight or nine years old, something which was easily accomplished due to her youth at the time. Despite her young age, she was apparently upset at the prospect of breaking a vow made before God, even on her behalf, and she spent many hours in prayer as a result. She was known to observe her religion meticulously, frequently fasting, reading, meditating and praying. After her son became king, she patronised many churches as well as the traditional benefactions to Oxford and Cambridge universities. She took a vow of chastity in 1499, separating from her husband, but they remained close. Margaret renewed these vows after Stanley’s death. Margaret’s relationship with Jasper is one of the things that I love about The White Queen (and The Red Queen in fact). It is, as far as we know, entirely fictional, yet it is somewhat plausible. In the absence of Edmund, there is no question that Jasper became a father to Henry, and their enforced exile in Brittany together meant that they would have been closer than most contemporary father-son relationships. After Edmund’s death, Jasper became Margaret’s protector and she lived with him for almost three years. The important thing to remember is that Margaret lived with him between the ages of thirteen and sixteen, which are quite formative years. It has been suggested that Jasper became ‘her protector’ which is understandable in a world where women required a male patron, in the absence of a husband. The only likeness of Jasper Tudor. A stained glass window picturing him with his wife, Catherine Woodville. This would, of course, be the only significant time that Margaret and Jasper would spend in each others close company. Otherwise, like her relationship with her son, any contact they had would have been through letters, mostly concerned with relevant information rather than sentiment. 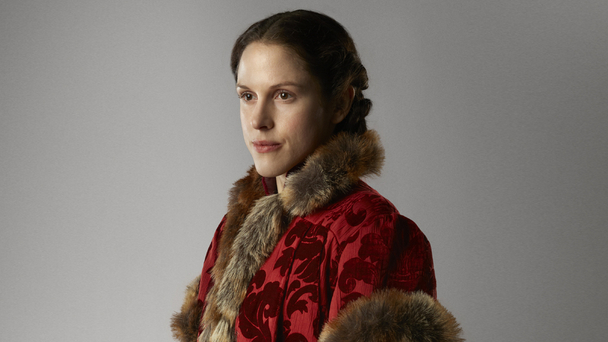 There are no accounts of them, together, after Henry’s accession as Margaret threw herself into the role of king’s mother, while Jasper married, for the first time, to the Dowager Queen Elizabeth’s sister, though it stands to reason that if the two remained friendly in any way, we would not know of it. It is also extremely doubtful that a woman so devoted to religion, as Margaret, would have ever given a thought to adultery. But in terms of two people loving each other from afar, united in their love for a child, it is at least a very pretty work of fiction. I can’t watch the series just now — how does her piety have a modern spin to it — is she saying anachronistic prayers or is it something deeper? I don’t remember much about her in the book, but she and Henry must have had an interesting relationship — the age gap between them was *so* small, she may have been more like his older sister in some ways. Oh dear, so annoying. Just once I’d like to see a historical in which the character who *isn’t* religious is the one who stands out! Its interesting and in some way sad what you say here about the depiction of Margaret in this (dire) series which I have not seen beyond episode 1, especially considering that none of the other characters seem to be very religious. Personally, I don;t think the claim of Edward IV was necessarily stronger than that of Henry VI who was a direct descendant in the male line of Edward III, whereas Edward’s claim was through the female line. Even those nobles who had confirmed his fathers claim had been reluctant to actually depose Henry. Arguably, his position could never have been fully secure until the Lancastrian line was eliminated which happened in 1471.